A runner and traveler who has learned not to take small things for granted. 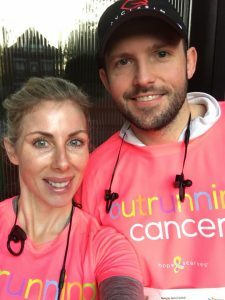 Lisa is beautifully living life over cancer. 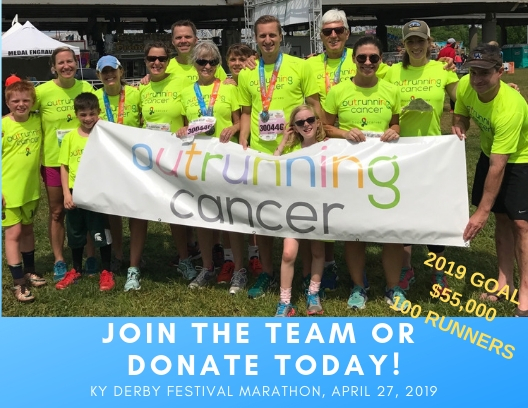 Every year outrunning cancer is a powerful display of love, teamwork and support at the Kentucky Derby Marathon. Every year, I love it. But, somehow this year broke all records! 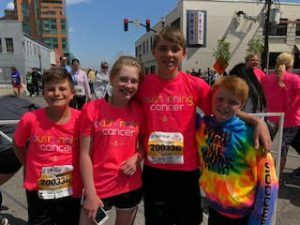 84 runners took to the streets of Louisville on Saturday, April 28th in hot pink race shirts that literally glowed in the sunshine. After three years of rain, the weather was perfect. At the start of the race we had already hit our $50,000 goal with $68,000 in donations. Today, as donations still come in, our total is $70,838. The most ever raised for this event! 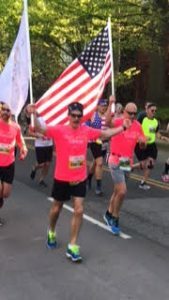 15 men ran the marathon together carrying a United States flag and a HopeScarves flag. 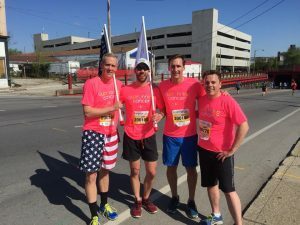 They are part of a work out group called F3, which stands for Fitness, Fellowship and Faith. Together they raised $13,006. Their team Captain Dan Bayer’s wife is a Hope Scarf recipient and storyteller. He knows first hand the power of hope and connection. Each time they handed off there were high-fives, fist bumps and an amazing energy of camaraderie. I am proud to have these rockstar guys on our team. The Louisville Collegiate Women – made up of 5 teachers from my sons’ school were equally impressive. 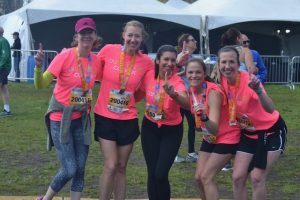 Their dedication shined as they powered through the course with fierce determination – all the way to winning the women’s relay division and coming in 3rd overall for the marathon relay. Never doubt what a group of strong women can accomplish. 3. Our 2018 honorary Team Captains lead team Leggin it for Lara. In their 70th year, both Art and Sue Plewka ran (yes, ran!) 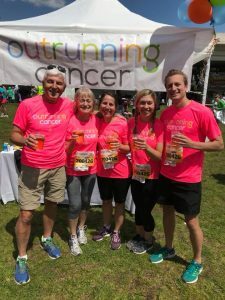 their 5k legs and radiated love with Anne, Eric and Lindsay for the 5th year in a row. We are all grateful for team mom, Anne Sanders for the snacks, water, phone chargers and precision driving skills to get us to all the transition points! 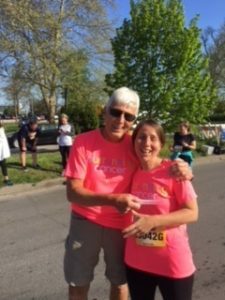 The Go Hope team took the grand prize for top fundraising team with $14,050 in donations- bringing Michigan love to the bluegrass. 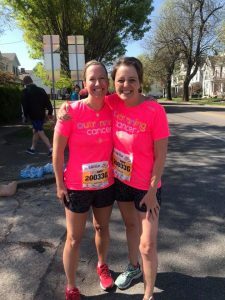 And they took on the 26.2 miles with the same commitment to fun. Running with their own speaker for on demand inspiration & making each other and runners around them laugh. 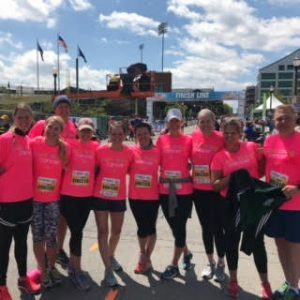 The Michigangster team brought our furthest traveled runners with Sara coming from North Carolina and Ally & Juliane traveling for two days from Minnesota to be on the team. 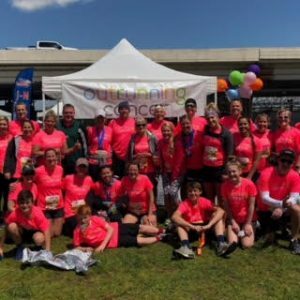 Together they raised $12,742 & showed the grit of the snowy north! Many more ran on teams of friends and family. And 25 ran the “whole mini”as individuals – 13.1 miles of sunshine and just about perfect running conditions! Everywhere you looked you saw bright pink and high fives! 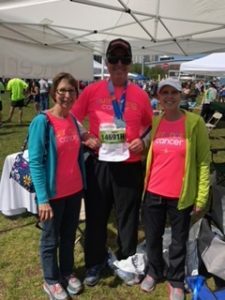 And, I ran/walked 7.8 miles as the anchor leg for our team with my friends Laura Ritchie & Chris DeYoung. I got the hand off from Bennett – who ran 3 miles, leaving his adult chaperone, Ally, in the dust. The weeks leading up the race I was bummed to not be at full strength to run 13.1 miles as I have in past years. But, all that quickly faded as I absorbed the energy and excitement of being on a relay team. 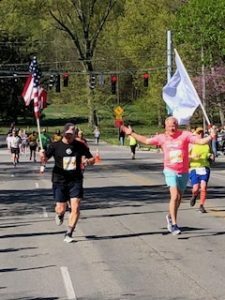 There is something special about moving the baton 26.2 miles together. The passing on, with a hug and words of encouragement struck me deeply. This is exactly what we do each week at Hope Scarves. Our very work is a relay. Hello!! 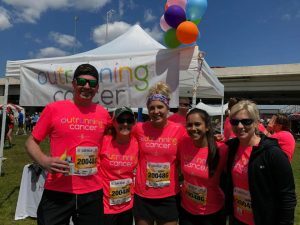 How appropriate that this is how we support Hope Scarves – in a relay. It took injury for me to see the joy that comes from completing this race together. That when you simply can’t do it on your own- you lean on others. You do it together. I felt empowered as I ran/walked those final miles. Careful to go slowly and grateful to simply be out there. One step at a time, my heart pounding, my legs, strong. At mile 26 a sea of bright pink was waiting for us. 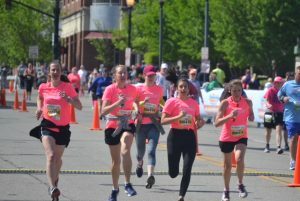 20+ people jumped onto the course to run to the finish line together. As we made that final turn my eye filled with tears and I pulled out my phone. I just had to capture it. I had to preserve this feeling of love and hope. Click here to watch our facebook live finish. I’m grateful to share it with our 544 donors and all the people we support at Hope Scarves. 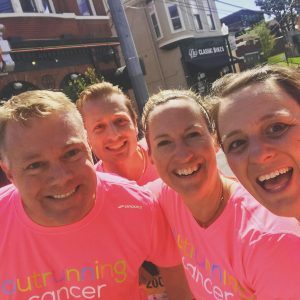 Because you were all there, Outrunning cancer!